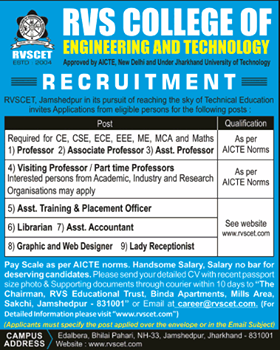 RVS College of Engineering and Technology, Jamshedpur has advertised in THE TIMES OF INDIA newspaper for the recruitment of Professor/Associate Professor/Assistant Professor jobs vacancies. Interested and eligible job aspirants are requested to apply with in 10 days. Check out further more details below. About College: RVSCET, Jamshedpur is a unit of RVS Educational Trust, which is widely recognized for its vision towards strengthening the proper professionalism with a mission that creates ingenious outburst in learning. The Management of RVSCET personally takes care of every bit of ground-breaking expansion of this Institute.